"Taking it to the Enemy"
Starbuck and Boomer lead the Maytoria guerrillas against the Cylons. Continuing from the previous issue, the guerillas realize the Cylon tracking device must have been secretly planted on Boomer when they briefly had him in custody. The group decides to continue its plan to steal a Cylon transport ship and they make their way through the ruins back to surface level. While trekking to the Cylon transportation hub, they encounter Cylon tanks and the battle resumes anew. Starbuck and Stadra manage to take over one of the tanks and turn it against the attacking forces. But they then lose control of the vehicle and it plunges off a bridge into the river depths. Boomer and the others are forced to leave them for dead and continue on towards the transport hub. Underwater, in the damaged, leaking tank, Starbuck and Stadra realize they have no choice but to open the hatch and let the water flood in, hoping they can swim to the surface. CONTINUED IN CLASSIC BATTLESTAR GALACTICA #4. The advertising image used in Dynamite Entertainment titles for this issue is slightly different than the cover image that appeared on the comic itself. In the ad, the Colonial Warrior is clearly Boomer and looks enough like actor Herbert Jefferson, Jr. to make the connection. On the cover, the face has been repainted to not resemble Jefferson so closely! Perhaps Dynamite did not have the license to use Jefferson's likeness and so had to change it? The guerillas' crossing of the suspension bridge on pages 8-15 is somewhat reminiscent of the crossing of the 69th Street Bridge near the end of Escape from New York, with the strewn debris, blasted vehicles, and gunfire. 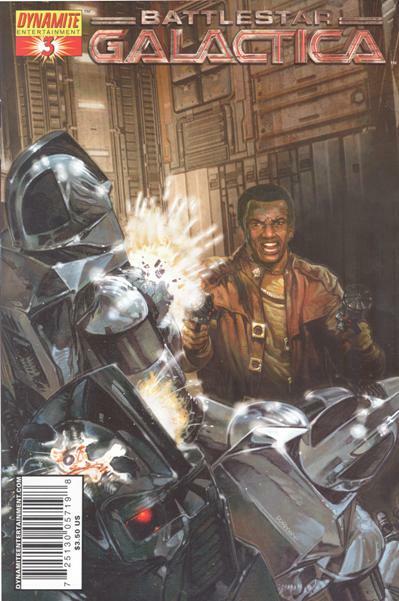 On page 10, we get a look at some Cylon tanks for the first time. 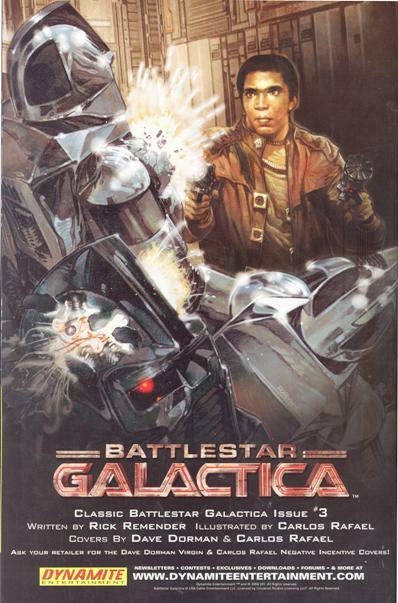 On page 17, during the battle with the humans, a Cylon uses the phrase, "Resistance is futile." This may be a reference to the Borg, a half-organic, half-cybernetic threat to the Federation on Star Trek: The Next Generation. On page 19, Freg remarks that they are three metrics away from the pyramid. According to the Battlestar Wiki, a metric is a Colonial unit of measurement equivalent to a kilometer.